5-10-2007 New Pricing on many cultivars! Watch for continual updates to this page throughout 2007, or Join the Notification List, to be notified of updates and specials. Plants marked RESERVED are the last piece available, and are being held for a customer that has not paid for them yet. I leave them here, because it is surprising how many people reserve a plant, then I never hear from them again. Until it is paid for, I leave it on the site. You may ask to be placed on a waiting list for RESERVED plants. One of the darkest Be Tris I have seen, this one has also produced seed for me, and has produced some great progeny. 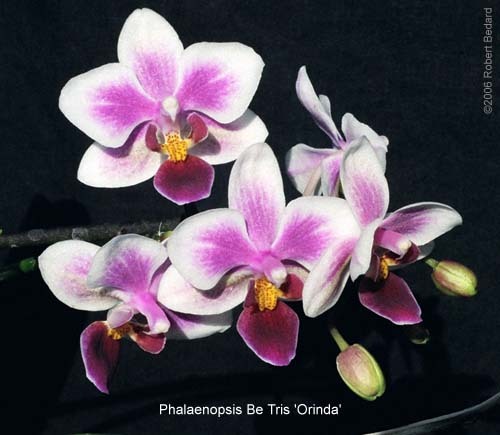 This selection was made by the Michels at Orchids Orinda and probably came from the Orchid Zone. This is one of the better Be Tris in terms of flower quality, successive flowering and freely producing keikis, but has so far not produced any seed for me. 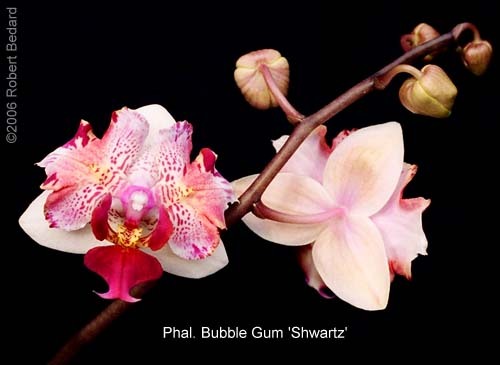 This selection was made by the Michels at Orchids Orinda and came from Zuma Canyon. This freely produces keikis. Excellent flower quality. 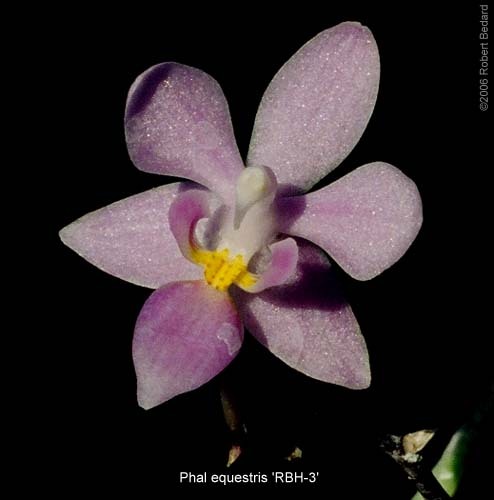 A selection from Mark Rose, this was one of several plants he was saving to get an AQ on this cross. High flower count and excellent shape make this a dramatic specimen plant. This is one of the best peloric flowers I have seen. It opens out flat, has great color and size. Ilocos form. 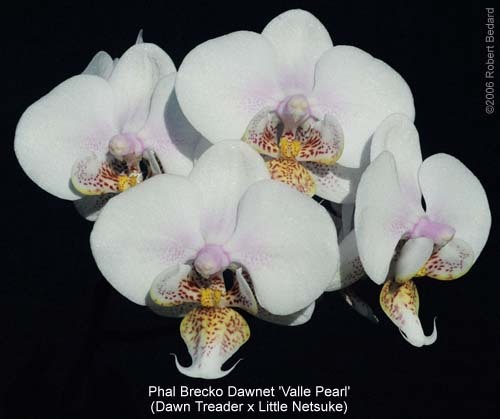 The "darkest" pink color of our diploid breeders. Slightly cupped, more successive flowering. Light pink, fragrant. Yellow callus. 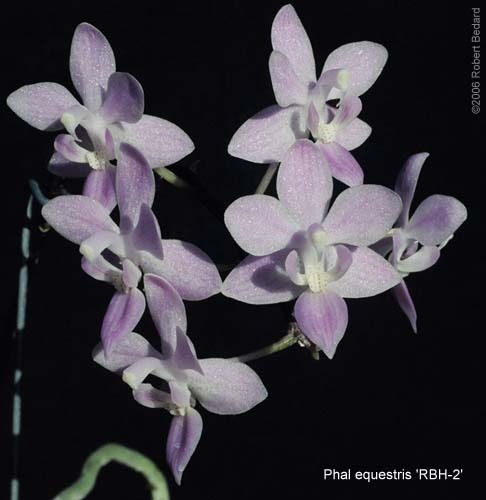 Tetraploid cultivar of "Tagalog" strain of equestris. Plants can become quite large, and inflorescenses dramatic. Very good (although very dominant) breeder. Reputed to be the best Golden Buddha for breeding right now. Produces great color in the progeny. 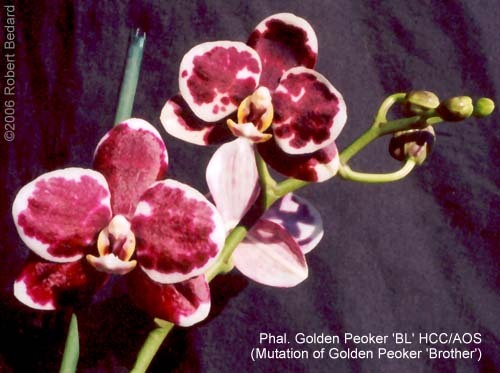 One of the Golden Peoker cultivars that has the Harlequin mutation. Excellent breeder. 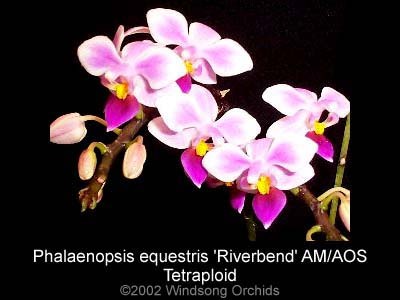 Tetraploid. 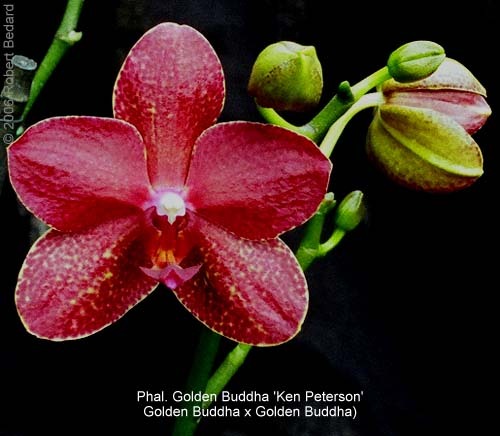 A must-have red-orange miniature Phalaenopsis that starts flowering on very small plants, and flowers nearly continuously on mature plants. Slightly fragrant. Moderately fertile. Will grow many keikis. Compact grower. 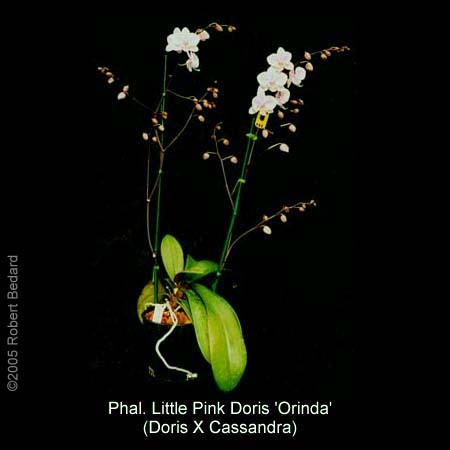 This fine example of a Little Pink Doris is the light pink shade of the tertraploid pink Doris, but has an inflorescence like Cassandra. 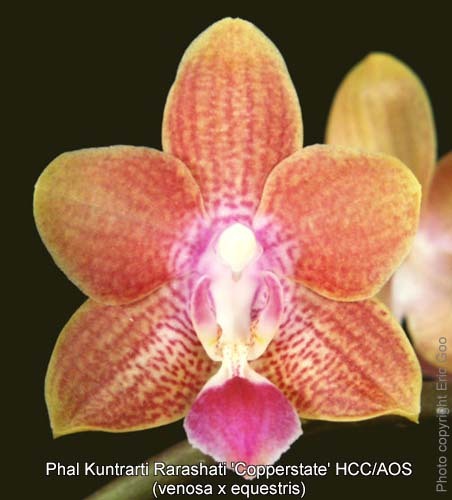 A mature plant may carry over 100 flowers per branched inflorescence, and a large plant may have several inflorescences. While I would expect this plant to be triploid, it is a surprisingly willing breeder, (including fertile pollen.) For me, the flowers are larger than the awarded white cultivar 'Cloud Cap' HCC/AOS. Flowers show a lot of the Doris parent. Divisions of selections from a population that was probably 'Selby' x self. Arguably the best cultivar from this excellent grex. A classic. Fantastic desert tone hybrid made at Shaffer's in the 1960's. You will find Painted Desert in the background of a number of good breeding lines, imparting color, size and vigor to it's progeny. Many Painted Desert progeny have been awarded, both in yellow and spotted lines of breeding. This plant tested positive for CyMV in 1986, it is probably still virused. 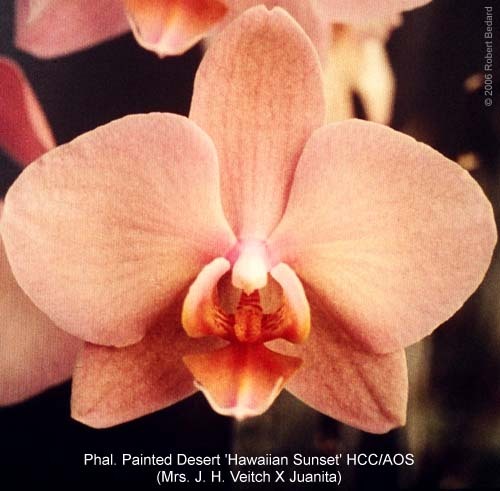 Develops best color in lower light. 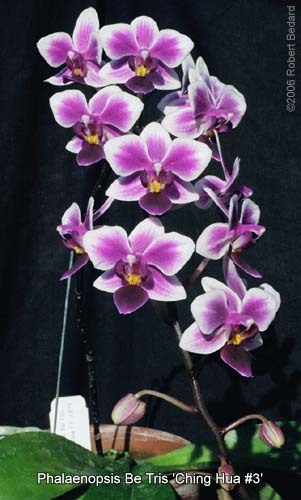 Phal stem props are established out of flask, a minimum of 6 inch leaf spread, (unless stated otherwise), and are guaranteed to be correctly labeled. In some cases, larger plants are also available.